Two buddies and I went up to Milwaukee to catch opening day on Friday since we had off of work for Good Friday. It was a last minute decision that put us at the stadium 20 minutes before first pitch. After some luck, we managed to secure three tickets in the family section (417) in the upper deck for only $20 each. Considering what few scalped tickets that were even available were going for, we were quite lucky & happy just to get in for a reasonable price. That is the final trash can that people can dump their empty beer cans & bottles into before entering the park. See, in Milwaukee tail gating is HUGE and they have no open container law. 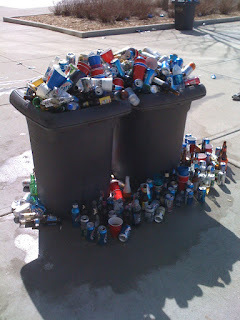 This being opening day for the Brew Crew on top of that, led to MASSIVE drinking before the game even started. My buddies and I having arrived only just before first pitch from Chicago were 100% sober at this point. We headed to the family section and once we realized we couldn't drink beers there, headed down the entrance to the section at the front of the upper deck where the was room to stand for the duration of the game. One thing we didn't take into account standing there is that the fans were then elevated about five feet above our heads making for easy targets for heckling and throwing food at us as we were all wearing Cubs gear. Now keep in mind here, that even though it was opening day for them, the crows was about 1/3 Cubs fans. I found out very quickly that this irritates Brewers fans a lot. I suppose if every time I went to a Cubs game at Wrigley vs. the Brewers and it was a third to half full of Brewers fans, I too would be irritated. Now, I have no problem being heckled as a visiting fan, I consider part of the game and sort of a badge of honor as well. It's when fans cross the line into swearing at you, throwing things at you (peanuts, full beer, etc.) that I find it a bit drastic and tasteless. This is why I no longer attend Cubs-White Sox games. 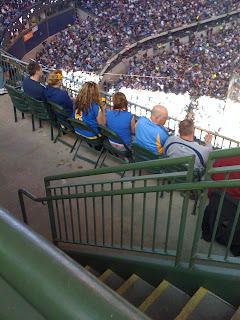 After being called FIBs (look it up) which I found amusing, we then had a white trash couple (yes, I know white trash couples go to Wrigley as well, but they seemed to represent Miller Park in strong numbers on Friday) try to challenge us to a fight after the Cubs took the lead. After my beer got knocked out of my hand and onto an innocent bystander who was a Brewers fan I made the mistake of laughing at the guy. I mean, come on, is it really worth it to get in a fight and get arrested over the Cubs-Brewers? (And consequently have my wife cut my nuts off when I got back home.) I think not. decided it would be a good idea to throw her full beer on me (did I mention they sell 24oz beers at Miller Park?) Fortunately, cooler heads prevailed and they decided to leave the game after that without incident. Funniest part of all is that they missed the Brewers come back for victory in the 9th because they left in the 8th. Despite all this, and the Cubs blowing it in the 9th (nice piece of fielding by Soriano there) it was a great game and we had a great time. 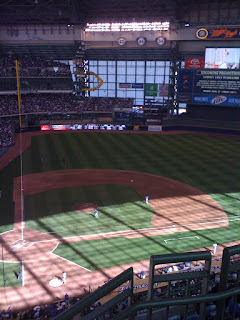 My advice for going to Cubs-Brewers games in Milwaukee is to be prepared to be hated and constantly yelled at. And if possible, wear something that beer runs off of quickly and you don't mind getting ruined. Finally despite what the fine gentlemen with tattoos on his elbows and wrists says to challenge you to fight on the concourse, don't take him up on it. You'll just end up in jail and then in the dog house with your wife. Fortunately, I followed this advice and was able to enjoy the evening out and about in Milwaukee after the game. I also recommend making sure the next day you'll have time for a four hour nap to adequately recover. Good times, good times. And I haven't even been to Wrigley yet.